A protester outside hearings for the Matoush uranium project in Mistissini sends a clear message. MiningWatch Canada is a founding member and supporter of the Coalition Québec meilleure mine (translated as the Better Mining Coalition with a clever pun – “mine’ also means face or apperance in French). For over five years now the Coalition has been pushing an agenda of mining reforms in Quebec. Thanks to their hard work raising issues, building grassroots political support and putting forward coherent policy proposals things are shifting dramatically in Quebec putting industry on the defensive. Unfortunately, as with many things, there has been little news of these developments in the media outside of Quebec. The two hottest issues at the moment are uranium and mining royalties, while respect for Indigenous rights remains an ongoing issue. Quebec has the most advanced uranium project in Canada outside of Saskatchewan. Following an environmental review of the advanced exploration phase of the Matoush Project the proponent, Strateco Resources, failed to gain the consent of the local Cree community of Mistissini who have in turn influenced the Grand Council of the Cree to call for a moratorium and the Assembly of First Nations of Quebec and Labrador to oppose uranium mining across the province. Strateco’s Matoush Project is not the only one in the province, with active exploration occurring. There have been a number of areas where uranium has been identified as a target for exploration. The First Nations’ opposition has jived well with a growing anti-nuclear movement in the non-native population. 300 communities have passed resolutions calling for a moratorium on uranium mining and an end to the use of nuclear power in Quebec. The pressure is having an effect with the shutdown of Gentilly II nuclear reactor and the recent announcement of a moratorium on uranium exploration and a strategic review of the risks associated with uranium production . 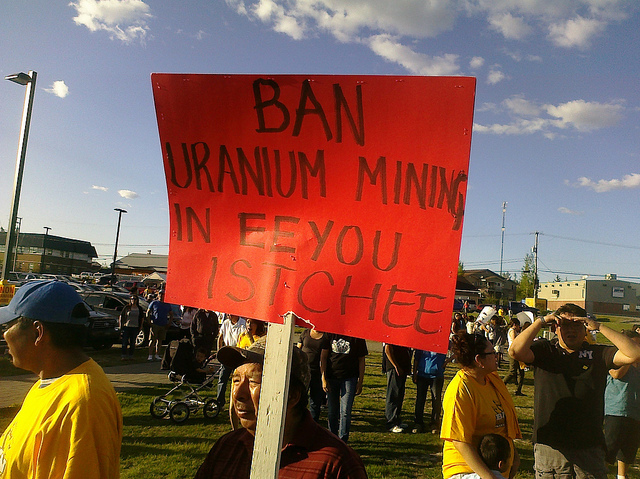 The review could lead to a permanent ban on mining uranium as there currently is in B.C. and Nova Scotia. The Grand Council of the Cree indicated its support for the review but also its disappointment with Quebec’s lack of negotiation over how the process would unfold. On the royalties front, movement has been positive for a few years – ever since a scathing review by Quebec’s auditor general showed the pathetic record of capturing public revenues from mining operations. The Charest government made some incremental changes upping the mining tax rate to 16% from 12% and insisting on the calculation of taxable profits mine by mine. Under sustained pressure to ensure a fair return to the province for the extraction on non-renewable resources, the Marois government has proposed going further with the addition of a 5% tax on the value of mineral sales (rather than on profits) and a 30% tax on super profits. Industry is lobbying back hard and even resorting to tactics that are more commonly employed by the activists. An online petition and a demo of paid mine workers in Abititi have made for what one journalist called a surreal situation. In recent years Québec meilleure mine has made progress building relationships with Indigenous peoples and there was a strong presence of Indigenous representatives at the coalition’s February forum. In response to a presentation from Natural Resources Minister Martine Ouellet , Ghislain Picard mused whether she was afraid to say the word “autochtone” as she had made no mention of Indigenous rights in her commitments to improve the legal and policy regime for mining. Quebec has yet to acknowledge the need for consultation, accommodation and consent at early phases of the mineral exploration and has largely abdicated its obligations for consultation to the mining companies. MiningWatch is working with three Algonquin communities and is in regular contact with other First Nations that are deeply frustrated by Quebec’s approach to consultation. Quebec also continues to push a controversial northern development plan “le Nord pour tous” a rebranded version of the previous government’s “Plan Nord”. The previous plan had gained the support of the Cree but not the other northern nations, the Inuit or the Innu. To date there are few details or indications about how about “le Nord pour tous” will distinguish itself from the Plan Nord (aside from increased royalties). Though important improvements, what has been proposed by the PQ government does not challenge the fundamentals of the current mining regime and free entry system. The party Quebec Solidaire on the other hand took the initiative to address the dominance of mining over other land uses by introducing a bill on March 20. The bill would give municipalities the ability to prevent mining and oil and gas developments within their boundaries. Another notable change that brought Quebec into the mainstream of mining regulation is the new requirements for 100% financial bonds for the costs of full mine closure. This is an improvement over the previous 70% for some portions of a mining site. The bonds must now be paid up within three years of starting production. At the February forum Minister Ouellet committed to addressing concerns of citizens that find themselves having to negotiate deals, file complaints, and lobby for responsible operations with multi-million of billion dollar companies. She indicated that there will be legal support to anyone facing expropriation but nothing was said about support for those in other types of conflicts with the industry. Lastly, and only meritting a short note because it's not a recent shift, as promised in the election the PQ finally ended its long-standing and myopic support for asbestos mining. As with other citizen responses in la Belle province, Québécois activists are certainly setting a good example for the rest of us in Canada.